A new patent from LG suggests the company has developed a new means of alleviating VR's 'screen door effect', which is where the gaps between a display's pixels are visible from within the headset. 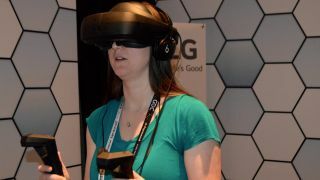 It's not yet clear whether the technology will make its way into LG's SteamVR headset that, which company has already been showing off in prototype form. Potentially the technology could make its way into an updated prototype, or else an entirely new Windows 10 Mixed Reality Headset to join the likes of Acer, HP and Dell. Specifically the new technology works by using a 'light diffusion member' to spread the light from the pixels over the black grid of the screen door. A higher density of pixels (such as those provided by a 4K display) could be another potential solution for the screen door effect, but this technology could potentially avoid the increased resource overhead required by 4K VR. Essentially it sounds like it's making more of the headset's existing pixels. It wouldn't be as sharp and crisp as a 4K headset, but theoretically LG could combine the new technology with a 4K panel for the best of both worlds. These are the best VR headsets out there right now.